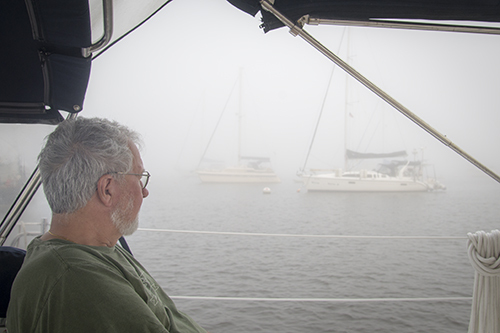 The fog was so thick the morning that we planned to leave Stuart, Florida, to begin our cruise on Windsong II to the Bahamas, we could hardly see the sailboats moored next to us at Sunset Bay. 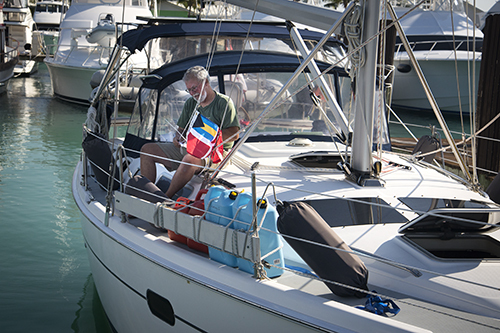 We were scheduled to meet our buddy boat, Tranquilizer, with Swiss friends Marco and Beatrice aboard at 9:00 am. One thing was clear though — we would be late! We weren’t going anywhere in that fog. We contacted our friends to let them know, and we all waited for the fog to clear. 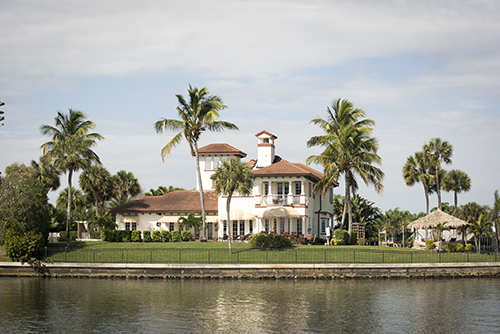 Fortunately, it wasn’t too long before we were heading down the St. Lucie River to the “crossroads” of the Intracoastal Waterway, Florida’s inland waterway. As we left the anchorage, we saw a dolphin swim by our boat, which I always take as a positive omen when beginning a trip on the water. 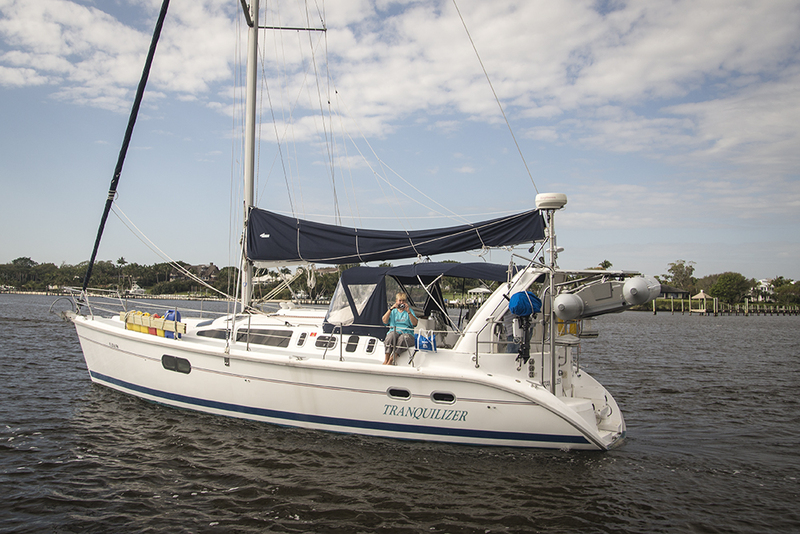 We met up with Tranquilizer and all went smoothly as we motored together down the ICW toward Lake Worth, where we planned to anchor beside the Palm Beach Inlet overnight as we had done before our two previous crossings. We had been studying the weather for weeks and Tuesday seemed like an ideal day to cross the mighty Gulf Stream to the Bahamas. The Gulf Stream is a river in the ocean that moves warm water from the Gulf of Mexico north along the coast of North America. It’s several thousand feet deep and 40 miles wide. The current in the centre can be more than 4 knots. Crossing it is nothing to trifle with. Vessels are pushed north even as they head east. When winds are brisk and northerly, there can be huge waves. So it’s important to wait until conditions are favourable to cross. Meeting up with our buddy boat, Tranquilizer…Beatrice and I taking pics of each other. Tranquilizer going through the Jupiter Federal Bridge. 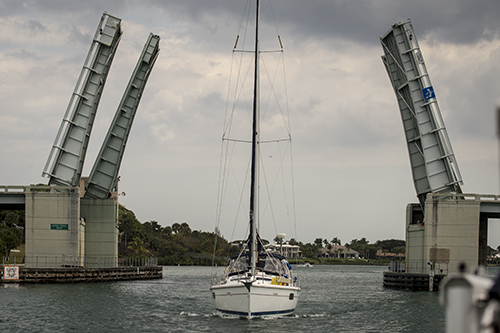 The particular part of the ICW from Suart to Palm Beach has about seven bascule or lift bridges, which must be raised for sailboats with tall masts (ours is 55 feet) to go through safely. A number are opened on demand and the rest open on a set schedule, such as the hour and half hour. We radio the bridge operators as we approach and make sure they know we are there and would like to go through when the bridge opens. The ICW can be very narrow in places and it is shared by all manner of watercraft, including large power boats with huge wakes, jet skis and people on stand up paddleboards. One particularly idiotic man was fishing in an inflatable canoe right beside a bridge. When the bridge opened, we proceeded full speed ahead. As we got to it, he decided to cross in front of us. We couldn’t stop and we couldn’t go around him. So we gave him five blasts of our air horn to indicate an emergency. He quickly realized his predicament and moved aside. Whew! Near the Palm Beach Inlet the night before the crossing, we toast to a good one! 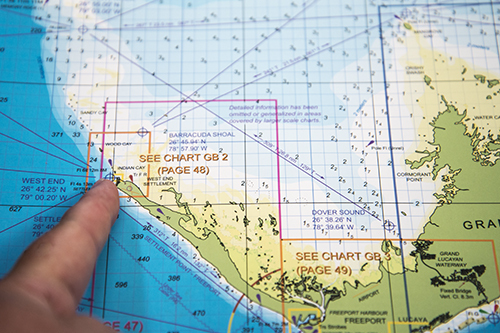 The crossing from Florida to the Bahamas is 56 nautical miles and took us 10 hours. 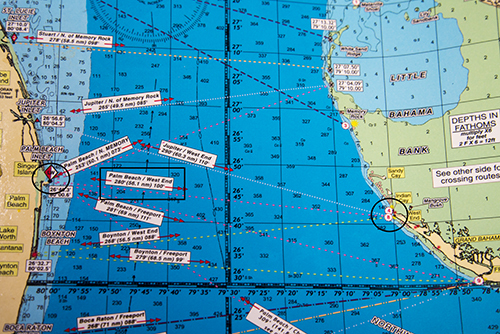 Our points of departure and arrival are circled in black. The Gulf Stream crossing went just fine although the beginning was “a bit traumatic” in Bob’s words. When we lifted anchors and moved through the Lake Worth Inlet at 4:00 am, it was pitch black — there were no stars or moon visible at all. To put it bluntly, it was really hard to see. As we came out onto the ocean, there was a lot of commercial boat traffic going in both directions. It was like trying to cross a busy highway. There were so many lights — some clear, some coloured, some flashing. What did they all mean? You have little depth perception in the dark. It is difficult to judge who is closest to you and who is farthest away. I kept staring at a whole range of lights in front of us. What is that?, I asked Bob. The AIS identified it as a tug boat and the radar showed two barges in tow about a half a mile behind it. They were connected by a wire just under the water. You don’t want to get between a tug and its tow. Using our radar and AIS to guide us, we waited for a break and then scampered across the sea lanes. Our buddy boat stayed close and it all worked out well in the end. It was a bit lumpy out on the ocean — the winds were light, as predicted. We put up our jibs anyway and motor sailed almost the whole way. Later on it was rolly, which we don’t particularly enjoy, but we had no symptoms of seasickness, so all was good. Once we got across the sea lanes there was very little traffic the rest of the way. I was able to get some video along the way, which really gives a good feel of what the journey was like. I hope to post it later. 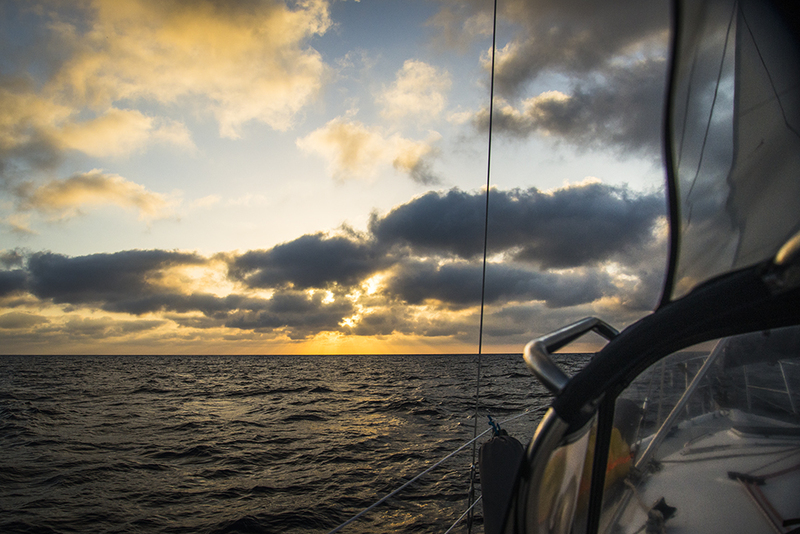 Heading east, and leaving in the dark, we had the chance to see the sun rise over the open ocean. We came into West End/Settlement Point under yellow flags at 2:00 pm and went straight into the slip we had reserved. Once we said hello to Marco and Beatrice and I sent a message home that we had arrived safely (and I kissed Bahamian terra firma! ), we walked over to the government office to clear the boat, get a cruising permit and fishing licence, and have our passports stamped. We were tired, but with our early start we now had time to relax, check the weather for the next day, take pictures and even go for a swim. Later we toasted another successful crossing with a bottle of champagne Tranquilizer had brought along for the occasion. Now, on to Great Sale Cay and the beginning of our island hopping Abacos cruise…. Bob gets ready to hoist the Bahamian courtesy flag after we cleared customs and immigration and took down the yellow flag. It’s the quarantine flag you raise when coming into a foreign port. No one can get off or on until the boat is cleared. In past days this was used to prevent the spread of disease but today it indicates a boat has not cleared customs. After you clear you raise the courtesy flag of the country you are in. Good info for trivia contests! What’s the yellow flag for? Great description of the start of the voyage – that shipping traffic is a nightmare, especially the tugs with tows. Going north to the Central Coast of BC, we need to travel parallel to the shipping channel for a long time. Thankfully, we’ve never done it in the dark – but we have (not by design) done it in the fog, without radar or AIS, and it was “traumatic” for sure – especially when a tug with tow suddenly showed up directly in front of us! Glad you made it safe and sound. Enjoy the sunshine and island hopping. 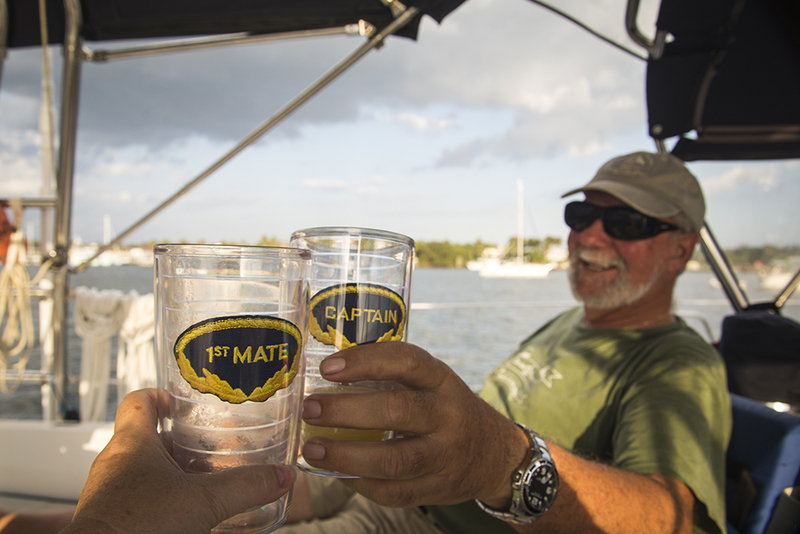 The 1st mate and Captain glasses…LOVE! Cheers! I love reading about your adventures. Stay safe. Oh this was fascinating. Many things I didn’t know before. Thank you for sharing these exploits with us. Enjoyed your story, Sherry. What fun to be able to go sailing with you. I wish you happy and safe island hopping. However, that gorgeous sunrise would make it all go away, I think.